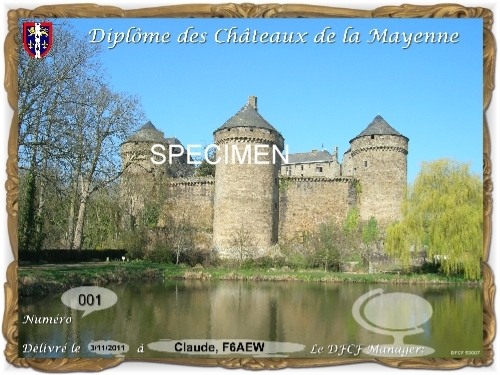 You should find on this site essential information on our activities in Mayenne Department. If you are just passing in the area, you will be welcome to visit or contact us. Provide the QSO or SWL Reports list with your request (no QSL asked) and send it by mail to F6AEW, Claude MASSON, 130 Avenue Maréchal Leclerc, 53940 St Berthevin or to F6KSU - Radio-Club des Fourches, 4 boulevard Frédéric Chaplet, 53000 Laval. - France. Diplome size is printed on a A4 size plastified quality coated paper. QSO made or SWL Reports using a FM repeater are not valid. Provide the QSO or SWL Report list with your request (no QSL asked) and send it by mail to F6KSU - Radio-club des Fourches, 4 boulevard Frédéric Chaplet, 53000 Laval. - France. Diplome size is printed on a A4 size coated paper.